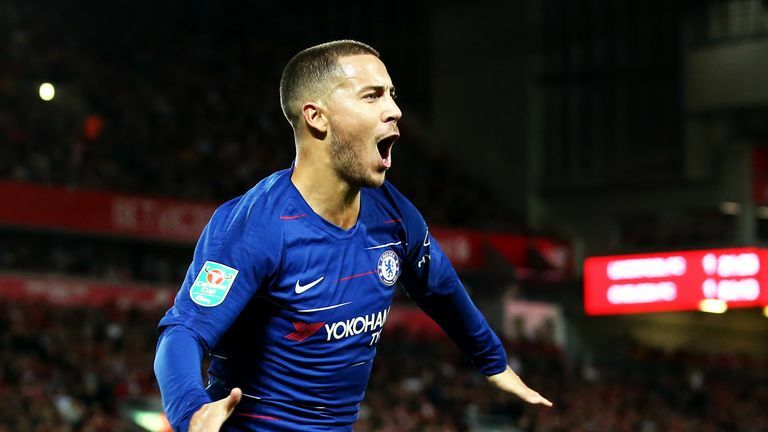 Hazard suggested last week he may have to leave Stamford Bridge for La Liga to fulfil his ambition of winning the Ballon d'Or, given the last ten winners have all been based in Spain. The 27-year-old also said he is torn about renewing his contract at Chelsea - which expires in 2020 - or achieving his childhood dream of moving to Real Madrid. When asked about Hazard's future, Sarri said: "It will be very important for us if he remains. I think also that he can win everything, also the Ballon d'Or, here. "For example, if Chelsea will be able to win the Champions League and the Belgium national team will be able to win the European cup (Championships), he will be able to win everything - without playing in Spain." Another player who has cast doubt upon his Chelsea future is Andreas Christensen, who said during the international break that he may seek to leave the club if his game-time does not increase. This week, Christensen's father and agent said he would seek a meeting with Chelsea to discuss his son's departure if Sarri did not play him more - but the head coach gave him short shrift. He said: "I am not interested in the father. What can I say? "I think in the first part of the season, David (Luiz) and Antonio (Rudiger) have played very well, so it's not easy to change. "I think also in our last six matches, Christensen has played in three. So I think for his father, probably the Europa League is not important, but for us it is important."